Home Applications Photos Review Prezo- Winner Of The Week! Prezo- Winner Of The Week! For those sharing the same vacation, trip, party or any other event, Prezo is more than just a social photo sharing app. Available in the Apple App Store for FREE; Prezo is being rated 4+ out of five so far. 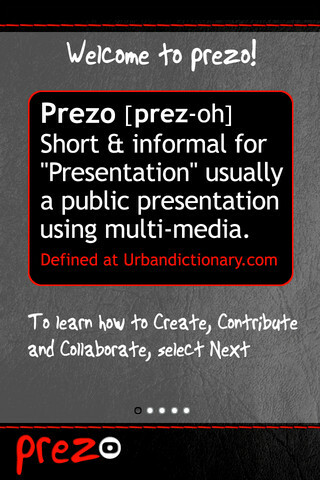 Called for the urban slang for "Presentation”, Prezo allows users to edit or view the same shared photo albums, called Prezos, based on permissions set by the owner. When any changes are made to the albums, Prezo owner and contributors are informed via push notifications, and can also view the albums as slide presentations at MyPrezo! Prezo makes dull photo sharing process all simple and fun, allowing users to even add captions and comments to the photos! Imagine being at a crowded event where the guests can contribute to a shared Prezo for the event, or being on a vacation where all photos taken by anyone are automatically shared with everyone else in your group. Despite the cases described above, Prezo is a great way to create a mobile portfolio or mobile sales presentation that can easily be viewed by customers and prospects! Imagine how easy it’d be if everyone on your birthday or wedding used Prezo for instant photo sharing- you’d no more have to ask each and every guest to share the event photos separately- you’d have one album with every single photo taken at the event! Prezos can be made private, shared for viewing, or editing by others. You can also allow your Prezos to be publicly searchable by any Prezo user. As we’ve already mentioned, Prezo is available in social networking category at the Apple App Store for FREE and requires iOS 4.0 or later to be fully functional on your iPhone, iPod touch, and iPad. The app has currently been updated to the current version 1.0.3, bringing better performance for image caching and multiple bug fixes! So it’s a great time to try one! To become the next winner and see the review of your app on our blog, get started now, check out how-to promote your apps on iPhone Blog for free!